Alice belongs to two worlds, the real one where shes following her dream to become the head of a company, and the storybook realm of Taleworld where she was born. These two worlds collide when her owl friend Gears returns with an urgent message. Her father has been arrested by the Queen of Hearts and will be executed for treason! 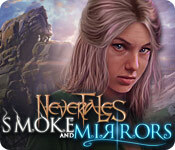 Alice must use her unique mirror powers to travel between the real world and Taleworld to make her way to the Queens castle. Alices mother is leading the resistance, but will they be strong enough to defeat the Queen?